The role of land plants in establishing our present day atmosphere is analysed. Before the evolution of land plants, photosynthesis by marine and fresh water organisms was not intensive enough to deplete CO2 from the atmosphere, the concentration of which was more than the order of magnitude higher than present. 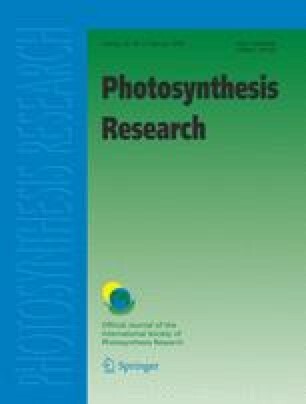 With the appearance of land plants, the exudation of organic acids by roots, following respiratory and photorespiratory metabolism, led to phosphate weathering from rocks thus increasing aquatic productivity. Weathering also replaced silicates by carbonates, thus decreasing the atmospheric CO2 concentration. As a result of both intensive photosynthesis and weathering, CO2 was depleted from the atmosphere down to low values approaching the compensation point of land plants. During the same time period, the atmospheric O2 concentration increased to maximum levels about 300 million years ago (Permo-Carboniferous boundary), establishing an O2/CO2 ratio above 1000. At this point, land plant productivity and weathering strongly decreased, exerting negative feedback on aquatic productivity. Increased CO2 concentrations were triggered by asteroid impacts and volcanic activity and in the Mesozoic era could be related to the gymnosperm flora with lower metabolic and weathering rates. A high O2/CO2 ratio is metabolically linked to the formation of citrate and oxalate, the main factors causing weathering, and to the production of reactive oxygen species, which triggered mutations and stimulated the evolution of land plants. The development of angiosperms resulted in a decrease in CO2 concentration during the Cenozoic era, which finally led to the glacial-interglacial oscillations in the Pleistocene epoch. Photorespiration, the rate of which is directly related to the O2/CO2 ratio, due to the dual function of Rubisco, may be an important mechanism in maintaining the limits of O2 and CO2 concentrations by restricting land plant productivity and weathering.